BRIAN HEAD – After firefighters worked for days to stop the Brian Head wildfire from jumping across Highway 143, spot fires spanned across the road near Mammoth Creek and Prince Mountain Saturday. Fire crews aggressively attacked the spot fires to prevent continued spread south of the highway, officials said. However, the fire itself grew another 4,000 acres throughout the day, bringing the total to 40,148 acres. Crews are conducting point protection at the townsites and remote homes throughout the fire area as the protection of life and property remains of utmost importance to fire managers. Point protection involves assessing homes and other infrastructures, making a plan for protecting them and implementing that plan if and when the fire reaches the sites. “Fire crews have had a great deal of success in protecting the communities affected by the Brian Head fire,” a news release issued by Color Country Fire Interagency stated. The number of structures lost is still at 13 residences and eight outbuildings. The fire is 8 percent contained. There are currently 11 helicopters, 41 engines and 29 crews comprising 996 firefighters. A Type 1 incident management team has been called in to assist the Type 2 incident management team that has been working the fire since June 17 when the fire started. Numerous resources are assigned to work on the night shift whose mission will be to protect structures and secure the spots across Highway 143. Tomorrow, the weather is expected to moderate slightly with lighter winds from the northwest. Current Evacuations – Additional evacuations have been issue today. Panguitch Lake, Horse Valley, Beaver Dam, Castle Valley, Blue Springs, Rainbow Meadows, Mammoth Creek, Dry Lakes, Second Left Hand Canyon and the town of Brian Head are all under evacuation by local law enforcement. Evacuees can contact the Red Cross for shelter information. If you live in an area affected by wildland fires, officials recommend familiarizing yourself with the Ready, Set, Go Program. Closures – Highway 143 is closed from the cemetery in Parowan to milepost 50 outside of Panguitch. Mammoth Creek Road is closed at the junction with Highway 143. The north side gate of 143/148 is closed. The Dixie National Forest has also expanded its area closure. Please check your route before planning recreational activities. 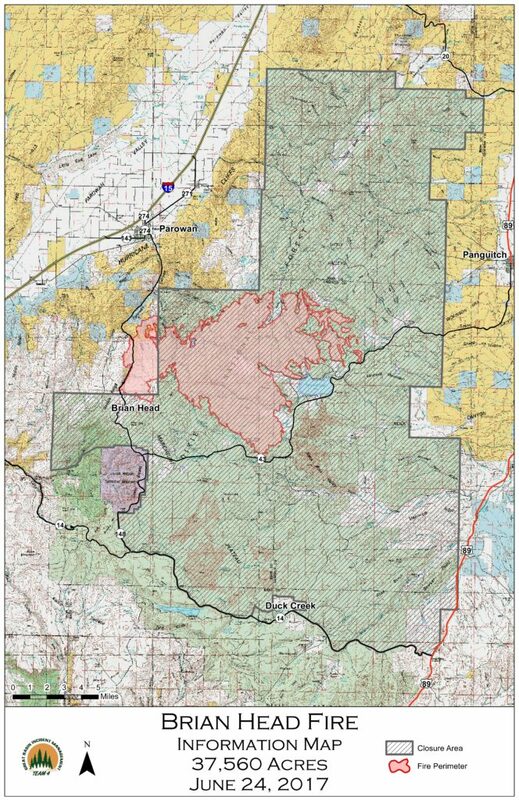 Maps and a thorough description of the closure area are posted at https://inciweb.nwcg.gov/incident/5253/. The Brian Head Fire started around midday June 17 and grew very quickly through dense timber on lands administered by Brian Head Town and Iron County in cooperation with the Utah Division of Forestry, Fire, and State Lands. It has since burned onto lands managed by Dixie National Forest and Color Country District Bureau of Land Management. Cedar Breaks National Monument remains open, with access via Highway 14.